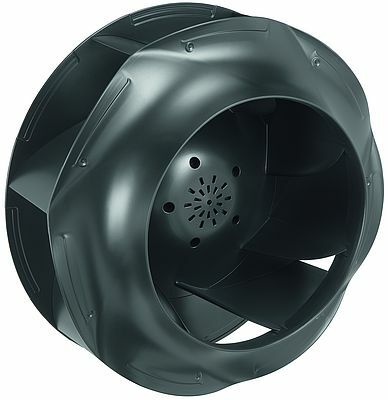 The complete low-pressure radial fan series RadiCal using EC technology now includes sizes from 133 to 630. A simple, mechanical 1:1 replacement of existing AC solutions is possible using EC technology thanks to identical dimensions for sizes of 190 to 250. This allows the advantages of EC technology to be utilized, such as energy efficiency, continuous open loop speed control and high power density, with just a small investment in time and money. In addition, the 250 size was supplemented with a variant with increased power. RadiCal fans can be controlled using a voltage anywhere from 0 to 10V; from size 280 onwards they are equipped with MODBUS by default. The motor’s improved thermal management guarantees high efficiency and also ensures high IP protection. In addition, using composite materials allows flow regulation to be optimally designed. This avoids flow separation and turbulence in the flow channel, which leads to increased efficiency and low noise emissions. In terms of efficiency, RadiCal fans surpass the minimum legal requirements for electrically powered fans. Eco-design Directive 327/2011 EU stipulates the minimum efficiency level for new fans on the market driven by motors with an electric input power of more than 125W.